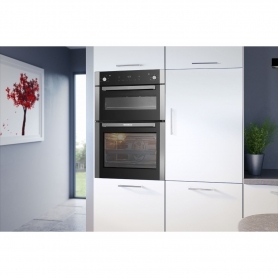 Cook up a storm with this built-in oven from Zanussi. Perfect for families of every size, the ZOP37982XK offers space and flexibility. It also comes with a modern stainless steel finish, to make a stylish addition to any kitchen. And, with the Space+ oven design, you’ll be able to cook and bake even more food. 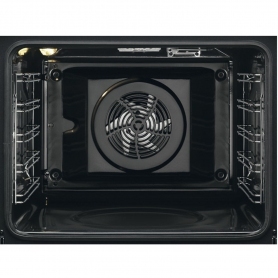 Have more room for your favourite dishes thanks to the XXL cavity and the 25% larger sized baking tray. 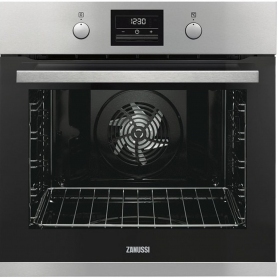 In this Zanussi model, you’ll find Multiplus oven technology. This means you’ll always find the perfect function, no matter what you’re cooking. And, thanks to the even heat distribution system, you’ll be able to cook on multiple levels at once. Zanussi has designed this built-in fan oven with you and your family in mind. Control and programme the ZOP37982XK easily with the digital LED display and retractable dials. Plus, save yourself hours of scrubbing with the pyrolytic self-cleaning feature. Use either the 60 or 90 minute cycle to burn any food stains into a fine ash. 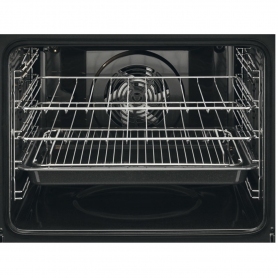 This can then be wiped away easily, thanks to the smooth enamel oven lining. You can also remove the oven door to soak off any marks with soapy water. Want to do your bit for the environment? Thanks to the ‘A’ energy rating and triple glazed glass, you can rest easy knowing that you’ve invested in an energy-efficient model. Make meal times easy with this fantastic built-in electric oven from Zanussi. Multitasking has never been so easy – add the ZOP37982XK to your basket today.